Wages are rising for the first time in two decades, with an overall unemployment rate of 3.8 percent, matching the lowest rate in 50 years. Delivering on policies that will promote economic freedom in these areas is key to making sure this rebound in dynamism doesn’t come to an abrupt halt. Fortunately, some policymakers, both in the U.S. and abroad, have been paying attention to the data presented in the index. More than half of the countries ranked in this year’s index registered gains in economic freedom. Others have stuck with discredited models of state planning and centralized control, and have reaped the consequences. Regrettably, the world remains divided between those who have economic freedom and those who do not. 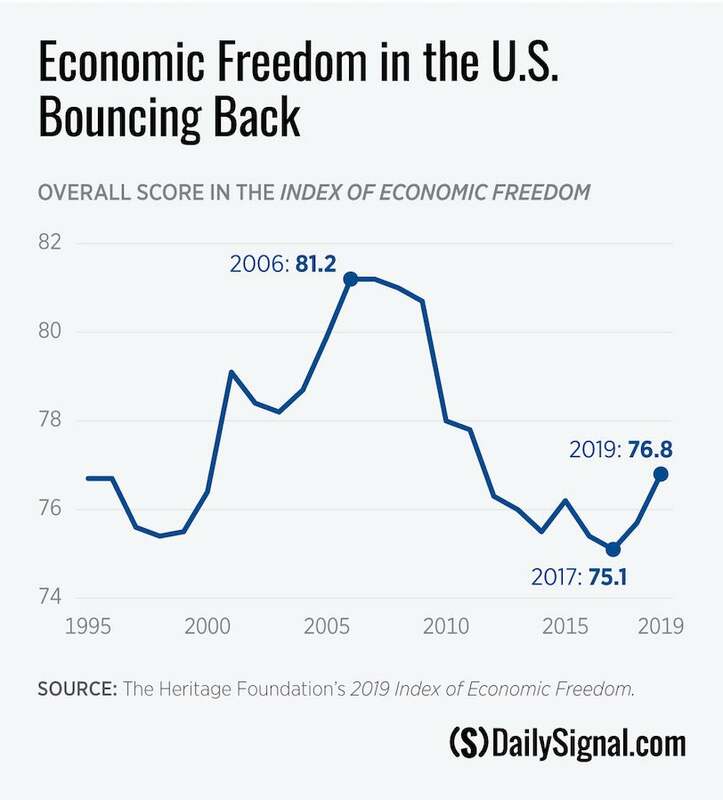 This year’s index results give cause for cautious optimism, but show that the task of restoring America’s economic freedom is far from complete. As the U.S. economy is becoming more vibrant, the coming months and years present unique opportunities to implement more freedom-oriented economic policies. America should build upon its new momentum. Why would we heap on more government spending, protectionism, and taxes? Cutting the corporate tax rate to a competitive level was a critical step to freeing up capital for investment. Reducing government spending remains equally vital to enhancing economic freedom and improving the country’s overall economic performance. It is also vital to keep the economy open to flows of international trade and investment. Protectionist policies are sure to hamper growth and reduce prosperity within the U.S., for individuals and businesses alike. 2019 is the year of renewed opportunity for America. We must not let it go to waste.